Tiegan Andrews, 18, of The Spinneys, Welton, has been sentenced after she pleaded guilty to two motoring offences, Lincoln Magistrates’ Court heard on March 24. The court was told how Andrews admitted driving a Vauxhall Corsa when she was more than one-and-a-half times over the legal limit. A test showed Andrews had 67 microgrammes of alcohol in 100 millilitres of breath. The incident happened in Newland, Lincoln on January 22. Andrews was banned from driving for 12 months and fined £120, the court was told. She was ordered to pay £40 costs to the Crown Prosecution Service and a £40 victim surcharge. And the court heard how Andrews admitted driving the Vauxhall Corsa without a valid licence - this also happened in Newland, Lincoln on January 22. Andrews was given no separate penalty for this offence. Daniel Bryan, 22, of Snelland Road, Wickenby, is to stand trial accused of an offence under the Criminal Justice Act, Lincoln Magistrates’ Court heard on March 24. The court was told how Mr Bryan is accused of assaulting a man by beating him in Market Rasen on September 3, last year. Mr Bryan has pleaded not guilty to the charge. He is due to stand trial at Lincoln Magistrates’ Court on June 10 and has been given conditional bail until this date. Sophie Mettam, 24, of Snelland Road, Wickenby, has pleaded not guilty to two charges under the Criminal Justice Act, Lincoln Magistrates’ Court heard on March 24. The court was told how Miss Mettam is accused of two counts of assaulting a man by beating him in Market Rasen on September 3, last year. She is due to stand trial on June 10. The case has been adjourned until this date and Miss Mettam has been given conditional bail. John Moulding, 31, of Willows Court, Spalding, has been sentenced for drink driving in Brookenby, Lincoln Magistrates’ Court heard on March 29. The court was told Moulding pleaded guilty to driving a Mercedes A180 when he was more than two times over the legal limit. A test showed he had 78 microgrammes of alcohol in 100 millilitres of breath, the court heard. The incident happened in Swinhope Road, Brookenby, on December 5, last year. The court heard how Moulding has been banned from driving for 20 months and fined £500. He has been ordered to pay £100 costs to the Crown Prosecution Service and a £50 victim surcharge, the court heard. Ruben Moses, 45, of no fixed abode, is to stand trial accused of an offence under the Malicious Communications Act, Lincoln Magistrates’ Court heard on March 31. The court was told how Mr Moses has been accused of sending a message to a woman which was, ‘in whole or part, of an indecent or grossly offensive nature for the purpose of causing distress or anxiety to the recipient or to any other person to whom you intended that it or its contents or nature should be communicated’. 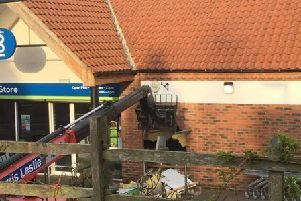 It allegedly happened in Market Rasen on March 9, the court was told. Mr Moses has entered a not guilty plea. Luke Frith, 28, of Hunts Lane, Hibaldstow, has been given a suspended prison sentence after he pleaded guilty to two charges, Scunthorpe Magistrates’ Court heard on April 5. The court was told how Frith admitted causing actual bodily harm after assaulting a woman in Barton on January 9. He was handed a 16-week prison sentence, suspended for two years, the court heard. He was also given a two-year restraining order and must be under a curfew with electronic monitoring for eight weeks, the court was told. Frith must pay £85 costs to the Crown Prosecution Service and an £80 victim surcharge. The court heard how Frith also admitted causing criminal damage to a woman’s iPhone 5S, to an unknown value, in Barton, on January 9. He was given no separate penalty for this charge, the court was told. Jeffrey Boryszczuk, 45, of Snelland Road, Wickenby, is to stand trial accused of an offence under the Vagrancy Act, Lincoln Magistrates’ Court heard on April 6. The court was told how Mr Boryszczuk has pleaded not guilty to begging in Bailgate, Lincoln, on November 16, last year. He is due to stand trial at Lincoln Magistrates’ Court on May 16. Mr Boryszczuk has been given unconditional bail until this date, the court was told.